Fruity fragrances, especially the fruity-floral variety, are notoriously polarizing. But all the sweet, refreshing and exceptionally popular fruity notes need to do to win over any critic is to be part of well-balanced mix. Blended right, fruity scents are light, playful, and completely irresistible to all that encounter them. How to wear a fruity eau? They’re the perfect complement to a linen blazer and sundresses in the summer months but also make for a refreshing fix in cooler months when you’re craving a reminder of brighter days. Fruits generally fall under two categories: fruity-fresh, youthful combinations that bottle the essence of fresh cut fruit, and fruity-rich, which feature exotic ingredients and are much more complex. Whichever you choose, there’s one guaranteed result whenever wearing a fruit-based perfume: bliss. Don’t believe us? Discover three of our classic fruit-laced blends, then try out the mood-boosting effects yourself. The Juicy, Polished Fruit As an intense fruity fragrance, it’s hard to decide exactly which fruits stand out most in Aventus. The first whiff reveals ripe pineapple, bright and tart apple, and citrusy bergamot, along with a refreshing, green quality from blackcurrant leaves. Then, once it dries, you’ll discover even more fruit—pink berries are balanced with earthy patchouli and woods—and a sensual base of ambergris, oakmoss, and musk for a subtle-bold effect that lingers all day. Aventus is a classic blend for a sophisticated wearer. The name couldn’t be more fitting: translating to “from the wind,” Aventus’ fans are known for their ambition. The Sweet, Graceful Fruit Aventus for Her is proof that you can be sweet >and powerful. It’s a more floral version of the classic Aventus and just like its counterpart, it’s inspired by history’s leaders. In this case, it’s strong women – queens, heads of state, and empresses (more than a few of which have been Creed devotees) – making it an ideal fit for modern women who aren’t afraid of going after what they want or embracing their feminine edge. What does it smell like? 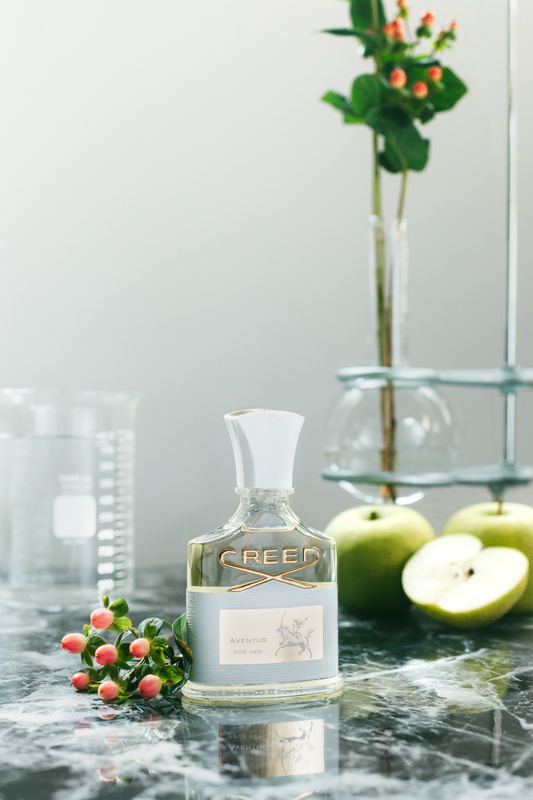 It’s unapologetically sweet, but never cloying, with Egyptian green apple, pink berries and bergamot, while ylang ylang and two types of rose add a rich, dewy quality. As you wear it, it dries to a musky and powdery finish, but never loses its signature sweetness thanks to base notes of peach and cassis. The Soft, Addicting Fruit Asian Green Tea is part of the Acqua Originale collection, a lineup of scents that use pure essential oils and are inspired by Seventh Generation Master Perfumer Olivier Creed’s journeys around the world. This particular blend is a trip to the ultra-green landscape of Malaysia. It starts out soft, effervescent and complex with lemon and petitgrain essential oil, bittersweet bergamot, and zesty mandarin, then turns simultaneously crisp, verdant, and rich with green tea and florals like rose, violet, and heliotrope. The effect is mesmerizing: mist on each wrist and don’t be surprised if more than one admirer stops you on the street.